During the Notre Dame-Pittsburgh football game on Saturday (Oct. 9), the University will recognize a special group of alumni and staff who represented the large Notre Dame contingent who helped with the recovery efforts after the January earthquake in Haiti. Léogâne, the city hit hardest by the quake, is home to the Notre Dame Haiti Program, which was founded by Rev. Thomas Streit, C.S.C., a professor of biological sciences, to eradicate lymphatic filariasis. Also volunteering in Léogâne are members of Emil’s Army, medical professionals who are former chemistry students of Professor Emeritus Emil T. Hofman. While the earthquake destroyed 90 percent of the city’s buildings, the Notre Dame structure remained standing and became command central for the entire region. Notre Dame was part of a critical team and relied on the efforts of alumni and staff to get food, water and medical supplies to the town. 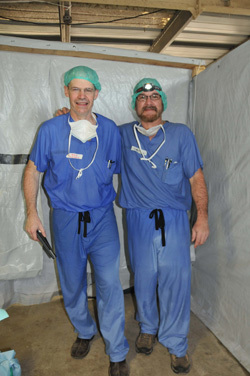 Among those to be recognized on the field is Dr. Ralph Pennino, a 1975 graduate of Notre Dame who—just days after the earthquake—mobilized a network of alumni medical professionals and set up a makeshift trauma hospital in Léogâne. In the first few months after the devastation, the volunteer doctors treated more than 25,000 people, performed more than 700 surgeries, and delivered more than 250 babies. 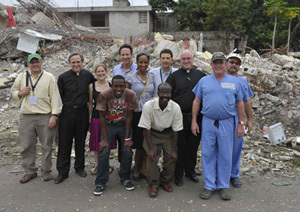 To learn more about how Notre Dame continues to support Haiti in its rebuilding efforts, visit committedtohaiti.nd.edu.